Click here to return to Konan University Homepage. Research in this laboratory focuses on function and cellular and molecular architecture of the central nervous system (CNS). As a model system to study CNS, we are using primitive chordates, ascidians. 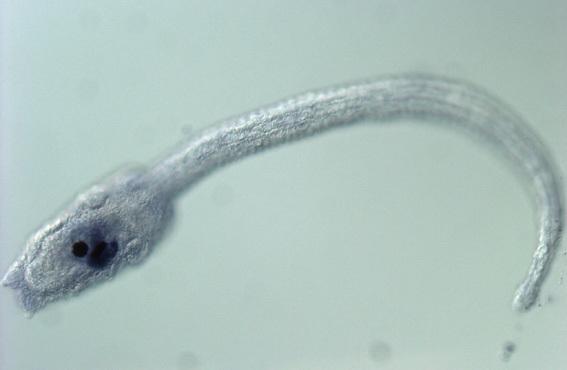 The fertilized egg of the ascidian Ciona intestinalis develops into a tadpole larva consisting of about 2,600 cells within 18 hours. The tadpole larva of ascidians shares a basic body plan with vertebrates. The CNS of the ascidian larva shows organization similar to that of vertebrates. Most anterior part of the CNS, the brain vesicle (sensory vesicle), contains two sensory organs, the ocellus (eye-spot) and the otolith (gravity sense organ). Posterior to the brain vesicle is the visceral ganglion containing motor neurons. The caudal nerve cord extends from the posterior end of the visceral ganglion to the tip of the tail. The CNS of the ascidian tadpole contains only about 370 cells; among them, less than 100 cells are neurons. Its similarity to the vertebrate CNS and simple organization make the ascidian larval CNS a unique model system to study function and development of the chordate CNS. Visiting Researcher (JSPS Fellow)　MATASSI, Giorgio　Ph.D.
Post-doctoral Fellow　SHIMAI, Kotaro　Ph.D.